Mama Nibbles: Raise Armpit Stain Remover Makes Shirts Like NEW! Raise Armpit Stain Remover Makes Shirts Like NEW! RAISE Armpit Stain Remover is the first ever stain remover to effectively eliminate underarm stains as well as ring around the collar. You will be able to restore shirts to new again. My husband has to wear a white tshirt under his dress shirt and tie every day for work and wow does that man get sweaty! I am constantly having to buy him new undershirts because the pits get so gross and stained. I have used bleach, soaked with stain lifters, used a powder form stain remover and even a stick type remover...none worked very well at all. After putting Raise to the test on my husband's stained tees I am sold. 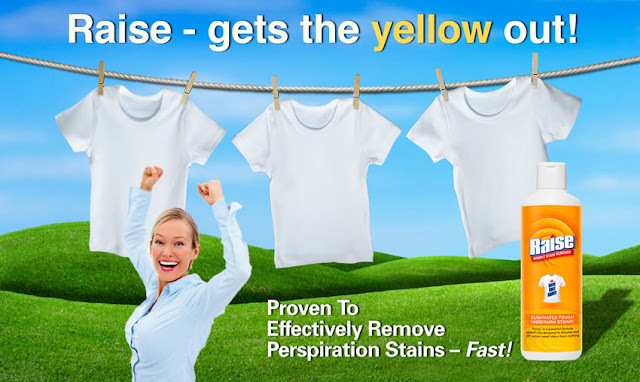 Raise lifted the stains and the shirts look like new again. Raise even was able to get out a grease spot on his favorite dress shirt, it really saved us a lot of money...dress shirts for a big & tall man are expensive! All I used was a little splash of Raise and rubbed it in with an old toothbrush (we save old ones for cleaning). I tested the shirt for color fastness before I cleaned it with Raise, I highly recommend doing so. For a limited time RAISE Armpit Stain Remover is offering a 2 for $20 special on their site www.armpitstainremover.com. 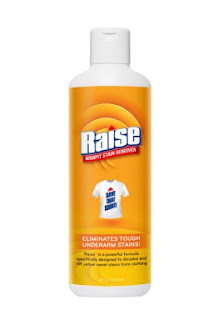 Don't just take their word for it (or mine), the Good Housekeeping Research Institute stated they were "genuinely impressed with RAISE's performance - even on old set-in stains."